A photographer outside the Christchurch Art Gallery. Behind him, members of Civil Defence have gathered outside after an aftershock hit during one of their briefings. The Christchurch Art Gallery served as the headquarters for Civil Defence after the 22 February 2011 earthquake. 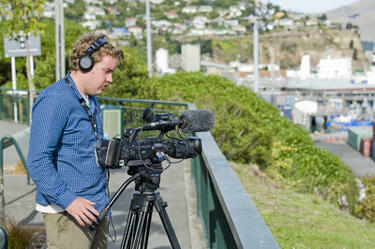 A camera operator filming the return of the HMNZS Canterbury to the Lyttelton Harbour after a trip to Wellington to resupply. 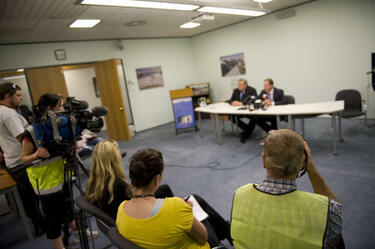 Camera crew filming Prime Minister John Key and Gerry Brownlee, the Minister of Economic Development, giving a briefing after the 22 February 2011 earthquake. 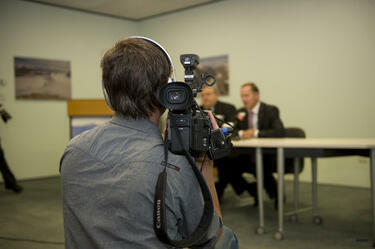 A camera operator filming Prime Minister John Key's briefing following the 22 February earthquake. 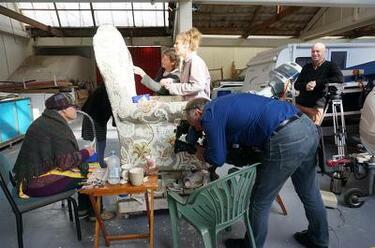 A photograph of a camera operator filming members of Crack'd for Christchurch as they work on their armchair artwork. Crack'd for Christchurch comments, "August 2014. Mike Thorpe and camera man filming Flora for Seven Sharp in anticipation of the launch. Only 4 weeks to go. No grout on the chair yet. From left: Sharon Wilson, Marie Hudson, and Jennie Cooper." Crack'd for Christchurch comments, "August 2014. Mike Thorpe and camera man filming Flora for Seven Sharp in anticipation of the launch. Only 4 weeks to go. No grout on the chair yet. From left: Helen Campbell, Jennie Cooper, and Marie Hudson." 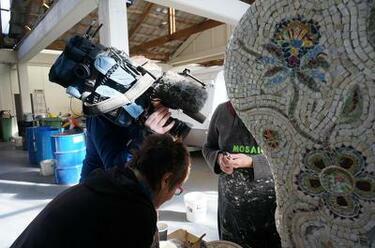 A photograph of a camera operator filming Marie Hudson as she works on Crack'd for Christchurch's armchair mosaic. Crack'd for Christchurch comments, "August 2014. Mike Thorpe and camera man filming Flora for Seven Sharp in anticipation of the launch. Only 4 weeks to go. No grout on the chair yet." A photograph of a camera operator filming Sharon Wilson and Jennie Cooper as they work on Crack'd for Christchurch's armchair artwork. 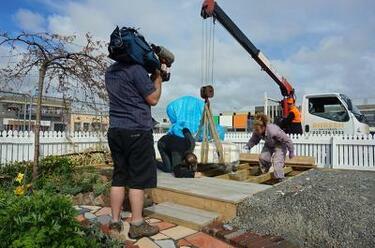 A photograph of a camera operator from TVNZ filming the placement of Crack'd for Christchurch's artwork ottoman onto a platform. The platform is in the Green Room garden on Colombo Street. 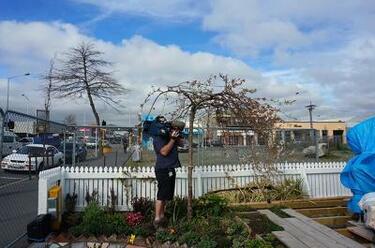 A photograph of a TVNZ camera operator filming the members of Crack'd for Christchurch during the launch of the Green Room garden. The members have gathered around their armchair and ottoman artwork. The armchair and ottoman are covered in white sheets and tied with a blue bow. They will be unveiled for the first time during the launch. Crack'd for Christchurch comments, "The whole team together." 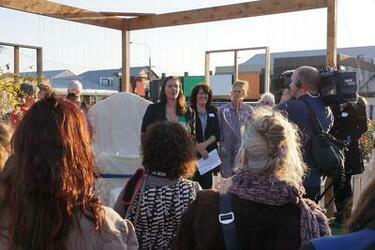 A photograph of Sarah Campagnolo, Project Co-ordinator for Greening the Rubble, speaking at the opening of the Green Room garden. In the background, members of Crack'd for Christchurch have gathered around their armchair and ottoman artworks. The artworks are wrapped in white sheets and tied with a bow. They will be unveiled for the first time during the launch. To the right, a camera operator from One News is filming the speech. 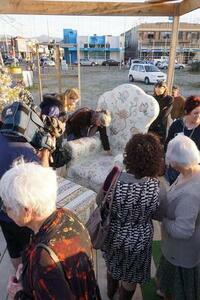 A photograph of members of the public examining Crack'd for Christchurch's armchair mosaic. 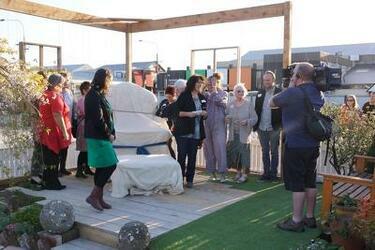 The armchair and ottoman artworks have just been unveiled during the launch of the Green Room garden on Colombo Street. In the foreground are several members of Crack'd for Christchurch. A camera operator from One News is also filming the event. A photograph of a camera operator from TVNZ filming the placement of Crack'd for Christchurch's ottoman artwork onto a platform. The platform is in the Green Room garden on Colombo Street.